Superman's chest logo (also known as the S-Shield) is legendary. But, it didn't always look like it does today. UPDATED: 4/4/2013 version 3. Many have requested a poster of this print. We cannot legally sell the poster since it contains copyrighted logos, but you're welcome to print it for personal use at a printing company like Kinko's. No other superhero symbol is more well-known as Superman's. His logo is iconic. You can show it to anyone and they'll recognize it. 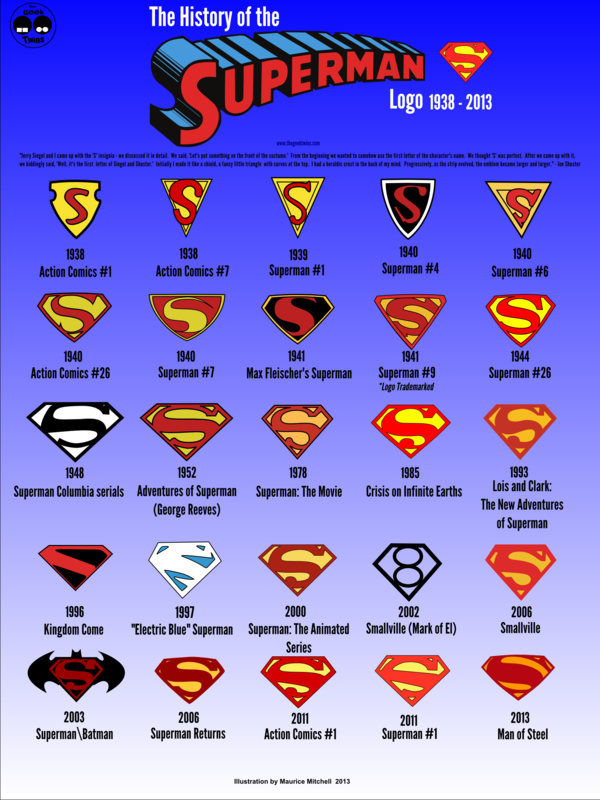 In fact, the Superman logo has changed dozens of times over the last 70-plus years since Action Comics #1. Some are so outlandish they're unrecognizable as Superman. Other logos are like the one we know, but slightly different. 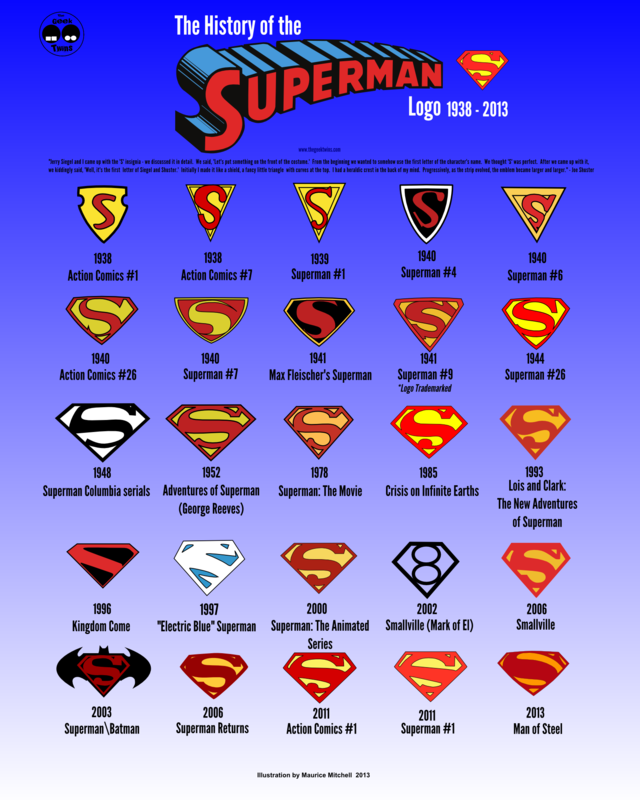 From it's humble beginnings to it's wildest transformations, here is the history of Superman's logo in one handy infographic. It doesn't have every logo, but it has all the most important ones. What do you think of the infographic? Do you have a favorite? How Many Movies Could Be Made For What "John Carter" Lost? The first few are really different. And way before my time. So it took until the 40s to get to what we think of now as the traditional Superman logo. Does it have more different incarnations than the Batman one? Awesome. This would make a great poster. That's a good question Pat. I've never tried to count them before. Way before my time too Alex. Slick though. Indeed! I made it poster sized Tony. The word “logo” only and ever refers to a corporate identifier. Companies have logos – Superman does not. The correct term is “Shield”; crest would be acceptable as well. Great point David. I looked up the definition and found this: "1. a graphic representation or symbol of a company name, trademark, abbreviation, etc., often uniquely designed for ready recognition." I know the Superman shield is trademarked, so I think it qualifies. It would be more accurate to say it's a DC logo more than a Superman logo though. What do you think? I searched all the symbols and color of two symbols are wrong, these are the first two symbols of the second row, the color of them are wrong,'' S'' such symbols is yellow and red is that this'' S'', but thanks for the picture. Nigel, I appreciate you coming to our defense but sometimes you come off insulting. He's making a valid point. Thanks for that Gabriel. You are 100% right. I'll fix it! Your welcome anytime. I love this type of infographic, Mo. How do you find them? Or do people inform you about them. My favorite Superman logo is the 1941 one. Classy yet cheesy at the same time. Still missing Superman: Red Son. Sorry this is late Jay, but either we make them (like this one) or we do a diligent search of the Internet. Sometimes people tell us about them, but it's rare.